We cannot protest what we are also facilitating. I’m Black. I’m queer. I’m from a wealthy family. I’m formally educated. I did not grow up in the city in which I currently live. I work for a nonprofit organization that provides health services to trans and queer young people experiencing homelessness. I live in a neighborhood where most of my neighbors are of a different racial and economic background than I am. I consider myself an activist. I’m involved in movements for prison and police abolition, for trans and queer resistance, for Black, Brown, immigrant and indigenous power. This makes it particularly difficult for me to acknowledge the fact that I am gentrifying my city. As was recently discussed in a piece for the Guardian, parts of my identity and the communities I belong to can obscure my impact on the displacing of other people. All over the country—in New York, DC, Oakland—there are activists, artists and scholars who belong to many of the exact same demographics as myself. We are young, radical, politically engaged, and changing the faces of our cities by forcing out longtime residents—those from the exact populations for which we claim to advocate in our professional and political lives. It is shocking how rarely we talk about this. I believe that in future eras, this will be one of the greatest contradictions for which our current efforts are criticized. At conferences and rallies, in collectives and on panels, we debate and decry structural oppression and state violence. We write essays and create art. We do some important and empowering work. We are expert at recognizing almost every form of violence, with the exception of the economic violence we inflict on our neighborhoods and cities daily. We are largely silent in calling out our own radical, queer communities for creating the very conditions against which all our work is ostensibly fighting. As activists and artists, as queer and trans people, as people of color, we live our lives in search of space. We are on constant lookout for support, for affirmation, affinity, the freedom to live fully, some semblance of safety. Yet in our quest for safety, we are disregarding the safety of the communities onto which we are descending, the people we are removing as we carve out space for ourselves. Our personal and political histories of struggle do not excuse this. We are dismantling poor and working, Black, Brown and immigrant communities, and we are hiding behind our rhetoric and resumes. We are posturing as revolutionaries as we gentrify, perpetrating economic violence on those already absorbing the most violence of any populations in our society. As people of multiple oppressions resisting unjust systems, it is more comfortable to focus on the ways in which we are impacted than in the ways we are implicated. We believe solidarity means we must highlight our commonalities, underline the oppressions we share rather than the privileges that stratify. Real solidarity means finding common ground with other queers and people of color, while holding ourselves accountable for the ways in which we are contributing to the displacement of our comrades in struggle. For queer people of color who are also activists, this is a unique charge. For the displacement we engage isn’t just about changing the material conditions of our neighborhoods, but equally about altering the faces of struggles that have existed long before our arrival in our current cities, taking over the leadership of movements we never founded. And as folks representing a complicated mixture of privileges and oppressions, we are often the unintentional bridge between the privileged and the oppressed—the link creating access between poor and working communities and those with the means to force them from their homes. The realization has to be this: We as Black, Brown, queer activists play crucial and necessary roles in facilitating the cycles of gentrification that reverberate throughout our cities. This means we are in a unique position to begin movements for its resistance, and to support the longstanding struggles against it led by those we have become complicit in displacing. Asking where our work is most needed—A friend of mine was recently fired from an educator position at a synagogue in their hometown for having their students question the legitimacy and violence of the Israeli nation state. As people with both oppressed and privileged identities, we must think creatively about where our labor is most useful and needed. The answer may not require us to move into whole new cities and spaces with the goal of “helping” oppressed people, but instead to commit to fighting systems of oppression by struggling with the oppressors in the communities that raised us. If we represent educational and economic privilege, perhaps it is those communities who need our activism more than poor and working ones. Supporting existing campaigns and struggles—Academic, artistic and activist gentrification is creating new projects, collectives and campaigns in our cities, without asking what projects, collectives and campaigns are already being fought for. Instead of building new movements in cities we are not from, we need to commit to learning about and supporting the struggles that are already taking place. When we see a gap, we need to create new spaces that are in communication with and directly connected to established ones, enhancing community struggles rather than replacing them. Centering true leaders—If we have the privilege to be mobile, are new to our cities, our neighborhoods, and the struggles they represent, we should not be the faces and voices of them. We must support existing campaigns and movements by using our privilege to center the voices, bodies and leadership of those who have been fighting them for the longest. We must end approaches to activism which are about generating brands and building careers for privileged activists. Real solidarity means humility, sharing our struggles, and consistently deferring to the authority and leadership of local, Black, Brown, poor and working activists. 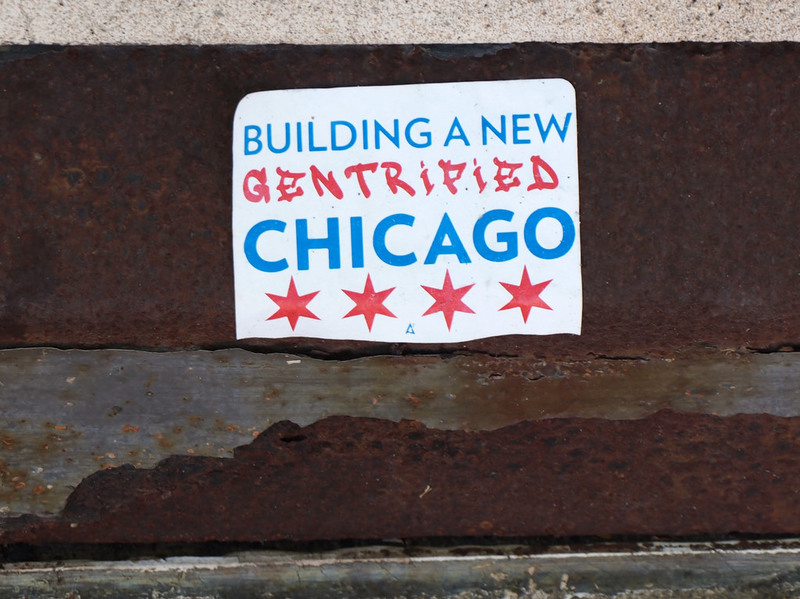 Holding institutions accountable—If we are to meaningfully challenge gentrification and displacement, our alliances as activist-intellectuals with the academy have to end once and for all. We need to hold academic institutions accountable for profiting off Black, Brown and Indigenous genius while policing Black and Brown communities within and around them, and investing their endowments in their murder. Radical movements need to boycott institutions that displace oppressed people by refusing to host conferences, panels and events within them. When we find ourselves coerced into participating in these institutions as students or faculty, we need to speak up about the violence they are continuously perpetrating on oppressed neighborhoods, and build movements for direct resistance on the inside. Ending the stigma of Black and Brown spaces—As Black and Brown people, we have the capacity to perpetrate racist values, and as queer people, we are capable of transphobia and homophobia. Especially when moving into communities with which we are not familiar, our desire for safety doesn’t justify labeling Black and Brown neighborhoods as sexist, transphobic or homophobic. For in everyone of these spaces, there are women, trans and queer people with their own demands and needs, different from our own. We need to call for an end to “feminist” and “queer” projects—art shows, dance parties, concerts, businesses—that infiltrate and desecrate Black and Brown spaces. Gentrification always does violence to women, trans and queer people, and so is never feminist, never about queer power. Supporting grassroots—over nonprofit—resistance—We need to stop focusing on nonprofit work as the primary site of revolutionary change. It is not, and never will be. Nonprofits institutionalize the demands of militant movements, burnout activists with bureaucratic minutia, and limit the scope of oppressed communities in their fight for justice. Moreover, the paid positions at these organizations are regularly taken up by activists with educational and economic privilege, granting them the capital to push out other queers and people of color in the name of activism. We need to disinvest from the nonprofit industrial complex, and reinvest into oppressed communities, which means supporting the radical projects Black, Brown, poor and working people have already begun in their own neighborhoods. Knowing our role—As queer people of color with educational and economic privilege, we are oppressed people who simultaneously share ties with communities of great power. Our largest role in the gentrification process is often inviting those communities into spaces where they are not welcome. Our oppressed identities can be seen as a form of legitimacy for white, wealthy, cis and straight people, justification for their moving into poor, Black, Brown, queer and trans spaces. Even when we ourselves are openly welcomed into certain neighborhoods, we need to be cognizant of who we are bringing with us, and under what pretenses. This means stepping back from spaces in which we are not welcome, and having real conversations with partners, family and friends about when they are not welcome. Ultimately, capitalism is what drives gentrification, just as it drives militarism, colonialism, and all past and current forms of displacement. Resistance must take on bigger forms than mere personal choices, and structural change requires direct action. But if we as the communities claiming to advocate for oppressed people everywhere only theorize change as we damage the cities and neighborhoods around us, our movements undo themselves. If we cannot as displaced people halt the behaviors that displace others, revolutionary solidarity is not possible. For our movements to grow in the ways which are most threatening, and for the most radical voices to be centered, we need to start recognizing when the best position for us to take is on the sidelines, just as we should recognize when the best way for us to support a community is by leaving it alone. Great post, as always. I have a question in response to the point “Hold institutions accountable”: what does accountability mean? It feels like I often encounter the idea inviked vaguely, without any measure of what that would look like. Do they need to be punished? Do they need to apologize for what they’re doing? Do they just need to make internal changes so it doesn’t happen again? Furthermore, what about the goals of simply stopping the institutions from doing what they’re doing (in this case, gentrifying)? What about destroying them? Are these part of accountability, or something else? Would love your thoughts. These are all really great questions for us all to think through, so thanks for asking them! Speaking only from my personal perspective, I’m interested in abolishing private education, so destroying institutions that are not community controlled is a longterm goal of mine. What that looks like in the immediate, what small steps in that direction that we can take now, is the question. Accountability for me is not an apology. That is never enough. It does look like ceasing gentrification projects, and restitutions and reparations for the oppressed communities that have been displaced, and whose poverty is the direct result of being robbed by wealthy institutions. The many forms reparation can take–and how we achieve it–becomes the next question. The University of Chicago, which has a heinous record of community policing and gentrification on the South Side of Chicago, just announced it will be building a level one trauma center after years of community pressure, and militant direct action on the part of Fearless Leading by the Youth, or FLY.